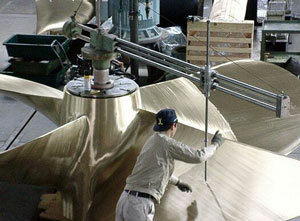 Quality control -ZHENJIANG JINYE PROPELLER CO.,LTD. Since we began in 1980s, Jinye propeller has insisted that only products of the highest quality are stamped with our name. We achieve this goal by using only top-quality, certified raw materials from reputable sources, and by taking the utmost, precise care in production. We verify our premium quality with frequent, documented process inspections, to ensure that all products leaving the factory exceed regulatory and contractual requirements. Our emphasis on exactness throughout the entire production process has given Jinye propeller our worldwide reputation for superior quality. We have complete measurements and instruments to do the measuring and testing in the producing and after propeller finished. Every process is recorded and reviewed. Such as material chemical testing, dimension measuring, balance testing, physical property experiment etc. All of them ensure our production in a strict quality control management, in this case , every propeller from Jinye propeller is high quality to be acceptable by our customers.